Groundbreaking musician and filmmaker Rob Zombie will unleash his “Great American Nightmare” on Los Angeles this Halloween season. This bone-chilling experience will combine the most advanced haunted house attractions with a not-to-be-missed music festival from top artists in hard rock, alternative, EDM, and more, every Thursday, Friday, Saturday and Sunday from October 10 through November 2, 2013 at the Fairplex FEARplex in Pomona, CA, just outside Los Angeles. A creative collaboration between masters of the macabre Rob Zombie and preeminent haunted house producer Steve Kopelman, the fully immersive haunted house experience will feature three attractions based on Zombie’s own horror films: Lords Of Salem Total Black Out, The Haunted World Of El Superbeasto 3D, and Haunt Of 1,000 Corpses. The shocking–and sometimes disturbing–fright attractions will offer a three-dimensional experience with animatronics and effects, a maze that is the ultimate definition of claustrophobia and fear, sudden chills and startling thrills, and salacioushumor that will make one scream with fright and laughter. 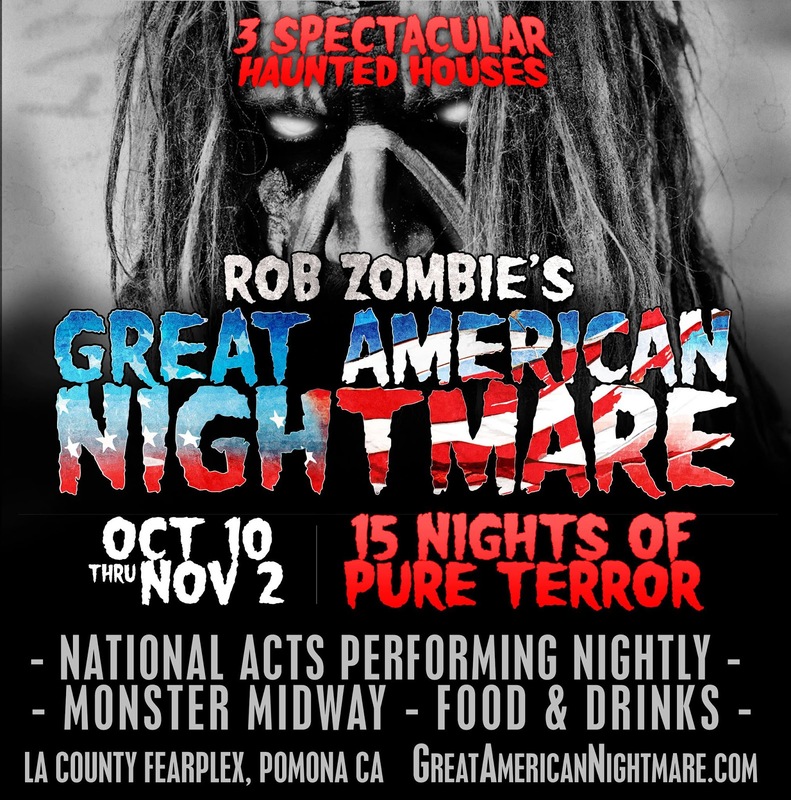 As if these sinister attractions weren’t enough, Rob Zombie’s Great American Nightmare will also feature 15 nights of music from top national and regional artists in the indie/punk, EDM, metal, rock and Latin genres including Andrew WK, BL3ND, Blood On The Dance Floor, Dirtyloud, Dirtyphonics, Doctor P, Emilie Autumn, Evol Intent, Fei-Fei, Goldfinger, Heavygrinder, Kottonmouth Kings, Metalachi, One More Time, Ozomatli, Reel Big Fish, Terravita, The Used, Twiztid, William Control, Zomboy, and many more. In addition to music, one special night will also feature the outrageous pro wrestling sensations Lucha Libre USA. Look for details about the music performance schedule–including additional major headlining acts–to be announced on June 29 and visit www.GreatAmericanNightmare.com for details. The FEARplex for Rob Zombie’s Great American Nightmare will include 150,000 square feet of horror and entertainment and is not geared towards young children or the faint of heart. Patrons should be prepared for maximum scares! Lords Of Salem In Total Black Out: This harrowing attraction–based on Zombie’s 2012 The Lords Of Salem independent horror film–is designed to twist the mind. It will accentuate some senses while limiting others. Fear of the dark, claustrophobia, and fear of the unknown will be preyed on as the visitor attempts to traverse this sixty-degree maze. The Haunted World Of El Superbeasto 3D: Utilizing Chromadepth glasses, this innovative attraction will take the patron right into the middle of the irreverent world of Rob Zombie’s El Superbeasto2009 animated exploitation musical horror comedy film based on the comic book series of the same name. The attraction’s unique surprise entrance, brilliant colors, sudden chills and startling thrills, and salacious humor will make one scream with fright and laughter. Haunt Of 1,000 Corpses: This terrifying attraction pays homage to the 10-year anniversary of the exploitation horror film House Of 1,000 Corpses, directed by Rob Zombie. This extreme, traditional haunted house will take visitors on a walking journey through a recreation of the film’s “Museum of Monsters & Madmen” along with an expanded “Murder Ride,” confronting notorious serial killers along the way. This high impact, highly detailed attraction will use state of the art animatronics, video effects, costuming, sound, scents and lights. Rob Zombie’s Great American Nightmare is produced by Rob Zombie, Steve Kopelman and Andy Gould, along with event music producers Kevin Lyman and John Reese. The Great American Nightmare Monster Midway will offer outdoor screenings of classic horror films, a DJ, food vendors, beer, wine and spirits, and much more, with freak show characters roaming throughout the grounds each night. Tickets for Rob Zombie’s Great American Nightmare are available starting at only $30 beginning Saturday, June 29 at www.GreatAmericanNightmare.com. Each ticket includes access to all haunted house attractions, concerts and midway activities. Tickets will also be available for purchase onsite at the Rockstar Energy Drink Mayhem Festival San Bernardino show at San Manuel Amphitheater (June 29) and during the Los Angeles County Fair at Pomona Fairplex (August 30-September 29). VIP packages will also be available for purchase at www.GreatAmericanNightmare.com. 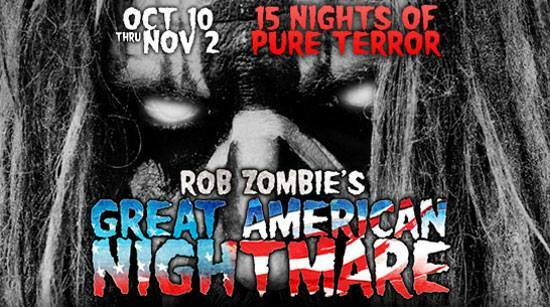 Hours for Rob Zombie’s Great American Nightmare will be 6:30 PM until 11:00 PM on Thursdays and Sundays, 6:30 PM until 1:00 AM on Fridays and Saturdays. The Fairplex is located at 1101 W. McKinley Avenue in Pomona, CA, centrally located in the heart of Southern California. The Fairplex is also home to the LA County Fair, the largest county fair in the world. Rob Zombie’s Great American Nightmare is made possible through the support of sponsors including Monster Energy Drink and Ernie Ball. ← ‘Night of the Demons: After-Party’ Announced!